MEDUSA QUEENS HALLOWEEN PARTY – QUEENS NYC - HOTTEST HALLOWEEN QUEENS MEDUSA HORROR STORY PARTY NYC WITH THE HOTTEST COSTUMES FEATURING THE FREAK SHOW! MUSIC BY NYC HOTTEST DJS MEGA 97.9 DJ NEW ERA, POWER 105.1 DJ CRE8, HOT 97 DJ C-LO & MORE AT MEDUSA NYC IN WOOODSIDE QUEENS! HALLOWEEN IN QUEENS NYC PARTY ! TICKET EVENT 21 & OVER! MEDUSA HORROR STORY HALLOWEEN PARTY AT MEDUSA LOUNGE IN QUEENS NEW YORK CITY, NY! CAPACITY EXPECTED! BUY YOUR TICKETS NOW FOR JUST 25$! EARLY BIRD SPECIAL! Medusa Queens NYC Halloween Dress Code: Its Halloween – be creative! Costume is MANDATORY! 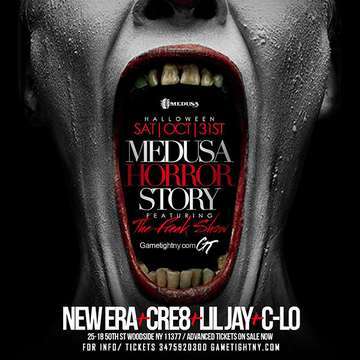 Medusa Lounge NYC Halloween Music Type: Best of Hip-Hop, Reggae, Latin, House, Dance, Top 40 & more! Medusa Queens Lounge NYC Halloween Bottle Packages: Bottle Prices available by request. RECAP OF LAST YEAR AT MEDUSA HALLOWEEN IN NYC!